Sharon Chen ’15 (Norwood, N.J.) and Aaron Walker ’18 (Strafford, Pa.) took home state championships in rhetorical criticism and impromptu speaking, respectively, during the Pennsylvania Forensic Association’s annual tournament Feb. 14-15 at Penn State University. The Forensics Society placed second overall and is preparing to compete in the National Forensics Association’s national tournament April 16-20 at Ohio University. The College has excelled on the national level, placing second in 2013 in the Lincoln Douglas debate portion of the tournament. In 2009, the team was the national champion in Division III speech, and in 2010, the team took second place in both the debate and Division III speech portions. 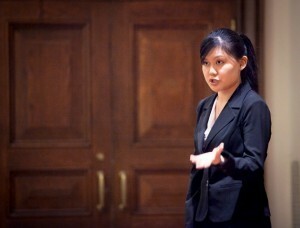 Chen, a double major in French and international affairs, also placed second in persuasion and won a bid to the Interstate Oratorical Association tournament April 24-26 at Berry College in Georgia. The tournament is the oldest oratorical contest in the United States and the speeches are published in the book Winning Orations.